Today I want to announce that Unclutterer, in conjunction with DYMO, is giving away a free DYMO labelmaker! You’ve read in the past about our love for the labelmaker, and now you can register to win one of your own. To enter for a chance to win the DYMO labelmaker, simply leave a comment to this post indicating that you want to participate in the drawing. On Friday, November 7, 2008, at 3:00 EST I will enter the number of comments into the Random Integer Generator at random.org and select a random winner. Good luck! Warning: If you leave a comment to this post that isn’t an entry, I will delete it. Nothing personal, I just don’t want to select a winner for the organizer who isn’t interested in participating in the giveaway. I love Dymo! And it would be perfect to have one before we move to California! Oooh… my father has a labeler, and I always want to use it when I go to their house. Definitely sign me up! OMG, I would so love this. I would label everything in a mad frenzy! Please enter me into this contest. I would love it. Oh yeah I’d love a Dymo!!!! …sorry, just getting some practice in. Sign me up! I’d like to enter, this I’ve never had a labelmaker for home! Yay labeler! Mine just died! Please enter me. Thanks for such a great blog! And yes, please enter me in the giveaway. I need a labelmaker. Ooh Ooh, pick me!! I’d love to get my hands on a label maker! Yes, please enter me! Thank you for your consistently great articles. And a label machine is always a welcome gadget when uncluttering. I’ve thought about this for years, but, being the procrastinator that I am, haven’t bought one. After reading the comments/reviews, I now know that I not only want this, I NEED IT! 🙂 Thanks! I’d like to enter! Thanks! I’m also from Sweden, but if possible, I’d like to enter and win! So, If someone who lives in other country could participate, please, give this chance! When I was a little girl, I wanted one of their old-school labeling machines. Santa never gave me one. Please enter me in the contest. I have always wanted one of those too! Fun! consider this my entry to the contest. thank you! Please enter me into the contest. Thank you! I’d love to win a DYMO, I’m in dire need of one, for the renovating our new house. The one I’ve been looking at has none of these fancy features… But since I’m Swedish I don’t know if I’m eligable for the contest, but it really would be awesome to win! Labeling is one of my most favorite things! I would love to enter your contest! I’d like to participate. I love comment contests! I want to enter! W00t! It figures. I just bought this exact label maker 3 days ago and I’m having a ball with it. My daughter has been trying to sneak it away to her house so if I win, she will have one of her own. Oooh! Is there anything better than neatly labeled items? I think not. Pick me!! ooh ooh ooh pick me pick me! Enter me in the contest please! Thanks! I’m in the UK but, if I’m eligible: Count me in, please! Please enter me in the drawing-I would love this! How cool it would be to win this! Gimme, gimme, gimme! Count me in. I’m up for a labelmaker. Artist from Wales here. I’d love a Dymo to make long Welsh lables. Diolch yn fawr. Hooray for labelmakers! I’d like to enter, too. I have a DYMO label maker, but it is old. I would love a new one. They are great! Oooh, it’s like the mother ship calling me home! Yes I want to be entered!! is it sad to get excited by label makers?? awesome – would love to get a label maker! Please sign me up. thanks for the giveaway! The only thing I like better than lists = labels! Right now I label my various boxes with masking tape and a marker. Not the tidiest looking effect. A label maker would make my art studio much nicer. Enter me please! I would loooove to win that labelmaker! I would love to replace the masking tape and marking pen system I use now, This would give my art studio a much neater look! Please enter me. Thanks! Yes! I totally need a label maker, so please enter me in the drawing. I would love to enter this! With 3 toddlers I could so use it! thanks for a chance to win this cool tool! Oooh I love label makers!Thanks for the contest! If I don’t win I am putting it on my christmas list! I love labelmakers! They make up for my terrible handwriting. I would like to win!! I would like to enter into the drawing. Show me the money! I mean… give me the labelmaker! I’d like to enter – we just moved and are in the process of organizing, this would come in super handy! please enter me into the draw. 🙂 I am from Canada by the way. I would like to enter the drawing also. Thanks! I can’t begin to explain how badly I want to win! I’m in Canada…hope that doesn’t disqualify me! I love giveaways! Please enter me in the drawing. Thank you for entering me! Thanks for the great articles. I would love to win! I hope the random generator picks me to win the label maker cause I need to get going on my unclutter journey…and this is a good way to start. Please enter me! I would love this! I would LOVE to win one of these. I can already think of many things I will label. Watch out folks you may be the next to be labeled. DYMO is such a cool organization tool. How fun it would be to use!! Please put me in the drawing. Thanks! Fun, fun! I could label everything with one of these!! This has been on my wishlist for quite some time. I’d like to enter the drawing. Thanks! Hi, I would love to participate to this drawing too. I am located in Europe but as the post does not highlight geographical limitations, I guess people from everywhere would qualify! Please enter me in the drawing for the labelmaker. Thank you. I’m from Scotland but if possible I would like to enter. Oh! Count me in. I can see myself running around the house labeling everything in sight. I love labels! Sign me up! I want to be part of this. Labelmakers are awesome! I don’t have one, so hope i’m the random pick! Please enter me into the contest for the labelmaker! I would love the labelmaker. AND, Friday is my birthday! Sign me up! OMG! I was just looking at this exact label maker. I would love it! Very interested in the Labelmaker! I would like to participate in the contest. I would love to get this labelmaker. I’ve always wanted my very own label maker! Please include me in the giveaway. This looks like a great labelmaker. I want to be included in this contest! I have always wanted my own label maker! Definitely sign me up, I am in desperate need. Me too, me too ! I really need this ! Thanks ! Please enter me in the drawing. I love label makers~they are so handy and really help make everything so organized! thanks. i would love to be entered. You couldnt figure out anything in my place right now if you walked in. If I got this I’d even label my CATS!! Enter me, please! I’ve always wanted a labelmaker, but it’s one of those things that I continually forget to buy! Labels and label making are crucial to being organized. I’d love to win this fabulous gadget! Me please! I want a holster for it so I can walk around like a labeler out of the wild wild west! Please include me in the drawing. I just organized two closets last night and I need to label! This would work great for when I start organizing my stuff this weekend! ooh labeler! Pick me please! My wife and I were just discussing how badly we need one of these! Enter my name in the drawing please! I’ve been needing to replace my labelmaker. Sign me up, please! Ooooooh….who has never wanted a labelmaker??!! I would have so much fun with this. Thanks for the draw, and the blog – love it. Those are fantastic! Please sign me up. Please enter me – that would so come in handy! Wow, looks like a really nice label maker. I could really use one!!! Pick Me! Pick Me! I always wanted a label maker. We have one in our business office but would love to have one for home. Thanks for having this contest. I’ll take it. And I won’t regift it, either (a la Elaine from Seinfeld). I need a label maker! I just gave back a labelmaker I was borrowing. Would be wonderful to have one of my own, so please enter me in the drawing. Thanks! yes, I’d like to enter … love those labelmakers ! I would LOVE a new labelmaker – mine is so old I’m worried I’m not going to be able to find replacement cartridges for it soon! I would love to be included in the drawing. 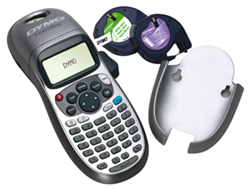 I had a dymo at work and LOVED it. I had one at work and it was great! I’m thinking about all those bins in the basement…. Consider this an entry! I love label-makers and that one looks rad! I want to participate in the drawing! sign me up! these things are great! I would love to win a new labelmaker! Thanks for the chance! I’d love to have my very own labelmaker! Please enter me for the drawing…looks great! I’d like one of them there labelin’ gadgets. Thanks. Thanks for including me! I’d love a new label maker! We enjoy your daily e-mail articles — you give us good ideas and sometimes a little laugh. Thanks for offering this useful tool for keeping things organized here. This is a gadget that EVERY true Unclutterer will want! Count me in on the drawing — and thanks for sharing it with us! I’d like to enter – I have lots of things that could use a label. Please enter me in the drawing-thanks! Please enter me in for the contest! Oooohh…. I love label makers, and need one! My previous label maker died an inglorious death during my last move. Thanks for giving me a chance to get a Dymo! Ohhh- my 10 year old labler just quit on me, so I’d love to get a free one to replace it! I’ve always wanted a labelmaker. I’m from Manila, but please sign me up! Oh I always wanted to have one! Please enter me in the draw! Unclutterer is listed in my Daily Necessities in Google reader, love it. I’d love a labelmaker! Consider me entered. I’d love to win a dymo labelmaker. Me, me! Would love a labelmaker. Thanks! Please enter me in the contest. I hope Dymo is giving away a good supply of tapes, too, because that’s where the expense is. I’d like to enter! Thank you. Count me in. I need all the help I can get. Woo hoo! Good luck everybody! Please enter me into the drawing for the label maker. Mine recently broke, so this would be a GREAT replacement. I would love a label maker! Sign me up! I’d like to participate in the drawing. I love your blog it’s always helpful. Enter me in to win the Dynamo Label maker. I could use it. Oh wow – this is just what I was going to get for my sister for Christmas! Maybe Mr. Random will pick me and help me save the $$! Almost as much as I heart labelmakers! This looks great! Sign me up! Count me in!!! I love label makers!!!! Please enter my name into the drawing.. I could regret it later when, due to my uncontrollable DYMO frenzy, everything–even the cats–has been labeled. But please enter me anyway! Oooh, I want to enter! The a sceen on mine just gave out. I’d like to enter, please. Thank you! I would like to be entered. What a great way to keep things organized. Thanks. Please throw my name in that hat! Please enter me!! I’d love to have a label maker. I could really use one of these – I am just starting to take on my life of clutter and this is a tool that would help. Hello. I’d like to enter. Thanks! PLEASE! PICK ME!! Thank you! Hand in air waving! Me, pick me. No wait, I’m jumping up and down waving both arms with newspaper pompoms. Please pick me!! Whoever wins, happy label making!! Please enter me in the drawing for the labelmaker. I’d like to enter, thanks. Cool. Please enter me. I would love one. Ooh! I want to enter! My labelmaker just bit the dust. Please enter me in the drawing! I’d love to have that label maker. I have a really old and really heavy Dymo that I have been using for years but recently I found out I can’t get the tapes anymore unless I hunt around on e-bay. I love the sveltness of this one! I want to participate in the drawing. oh oh oh pick me!! I’d absolutely love a label maker. I’d love to enter the giveaway! I’ve wanted one of these for a long time! Please enter me in the drawing…thanks. I’d like a shot at it! Thanks! I’d love this labelmaker. The memory for frequently used labels makes it even better than the standard labelmakers! i AM A CLUTTER trying to reform. I’d love to win the labelmaker! I’m from Canada though, hope I still qualify! Looks like a super useful tool! I would love to have a Dymo Labelmaker! Want! Keep thinking about buying one of these. Me! Me! I want to participate! Me! Please enter me in the drawing. Sometimes my DH handwriting can be hard to decipher on his workbench. I would LOVE a label maker. Please enter me! I love to label! Please enter me in the drawing. Thank you! Yessir! Sign me up, in case I’m the lucky one, i’ll be willing to pay for delivery to the Netherlands. I am drooling over that label maker. I want in please!! I’ve spent the last year of my life de-cluttering my house, and a label-maker would be the icing on the cake! Heck yes, I’d love one! I would LOVE a labelmaker. I’ve been looking online recently trying to decide which kind I should get. I would love this label maker, please enter me! I’d love one! Enter me! Pick me! Please enter me! I love Dymo products. They are great! I was just talking about how I needed one of these. Label Maker is good. Consider me entered. I live to label! Count me in, thanks! Please enter me, too. I hope I win. I’ve always wanted one of these! What a great giveaway! I would love to be entered into the drawing. Thanks! Ooooh–I’d love to win this Dymo. I’m a big proponent of labeling! Thanks for the chance. I would love to win the Dymo Labelmaker! I love the Dymo system. It’s a major part of my home and office organization. If Sydney, Australia is eligible, Count me in please. Cheers! I would love a labelmaker. Thanks for the contest! I’d go label crazy. Count me in! I think that would give me a boost at organizing. Please enter me. I’d love to have this! I’m planning on setting up a magnetic spice rack to contain my (almost a hundred varieties of) spices, and the magnetic labels would be perfect! Definitely count me in. My SO keeps using mine! Count me in the drawing too! Add me to the list! I’ve wanted a label maker for years but just can’t bring myself to actually purchase one. Please enter me in the random drawing. I’m about as random as they come, so this is perfect for me!!!!!! Hi. I would like to enter as well. I don’t know if I’ll be eligible as I live in Canada. please please please enter me! thanks! A brand new Dymo would make my week!!! Yes please. I would love a labelmaker!!! I’d love to win this Dymo! Please enter me in your drawing. I’d love a labelmaker! Oooohhh, I’ve wanted one of these for a long time! Thanks for the opportunity! Ooh – enter me too. Fabulous prize! I’ve been looking to get one of these for a while! please enter me in the drawing. Thanks! I’d love to get a label maker. I’m in, I love DYMO. I’d like to enter too, thanks! I’d love a label maker – count me in! I love labeling stuff. Please enter me. Thanks for the opportunity (and a great web site). Please enter me too. This would come in very handy! I’d love a new label maker…please enter me. I love label makers. They are wonderful tools to help my children make professional looking school poster projects with little help from Mom! Please enter me. My husband keeps threatening to buy me a labelmaker, but never comes through on the promise! Please enter me in the giveaway contest. And thanks for hosting it — great idea! First time to comment, but read your site daily. Keep up the great work. Love unitasker Wed! Ooh, awesome! I hope I win! Sign me up please! My sister is a teacher and I’m forever jealous of her label maker!! Yes! Please enter me! Label makers make me happy! These are great! Thanks for the chance to win! Please sign me up! Thank you so much for this opportunity! I would love to have a label maker! I would like to enter the contest!! thank you for a chance to win!! The office where I used to work used Dymo products and they’re great. I’d love to use this to get my home office and my kids’ things organized. I’m in the UK – if I’m eligible count me in as well. A label machine would be just fanstatic to help me organise all my beadings supplies. Please enter me in the draw. Thanks for this chance. Thanks for the great blog. I look forward to the emails everyday! Please enter me in this contest. A labelmaker would come in so useful for the organizing I’m doing right now. I’d like to participate in the drawing. Thanks! I would love to have this to label everything. I would love to be able to label my stuff! Please enter me in the drawing. OH man, I’ve been wanting one of these FOREVER! Enter me, please! please enter me in this giveaway – my cluttered nest just demands more padding! Thanks for the offer. Please enter my name in the drawing. I would love to win this! Thanks for the fun drawing. I would LOVE this!!! I need to get organized!! I totally need one of these. Please enter me! Thanks! Oooh. I’ve been looking for a labelmaker for a couple of years now. I would love to get my hands on one. Pick me! Pick me! I would like to enter! I’ve been wanting one of these! Thanks. I’ve not broken into labeling yet with a machine. Thanks for the opportunity to do so now! I really need a new labelmaker…mine just broke. Please enter me in the drawing! I love it! Oh, I was just thinking that I was going to ask for something like this for Christmas! Definitely count me in! I was thinking of getting one of these for christmas maybe. To win the drawing would be excellent. I can see how this will come in handy around the house for years to come. In it to win it. Love your site. I would like to enter the drawing. Thanks! Yes please, I’d love one. Dymo’s handwriting looks way better than mine. Oooh, that’s so much fancier than the one I kept in my organizing tool kit. Please enter me in the drawing. This would be a big help in my quest to ‘unclutter’. This would be so useful as we try to organize our lives! It is has been a month since our wedding and we are still digging out from under all of the little projects. The living room may never fully recover. Having a label maker to help me organize would be like Christmas to me!! Sign me up please! I’d like to be entered to win the label maker! Thanks! already dreaming of the beautiful labels I could make. please pick me! I’d love a new Dymo. I have an older one but I like the improved display and button layout on this one. I would love this, too. Thanks for the contest! Count me in, maybe it’ll be the kick I need to get my office space in order! Please enter me in the contest, I need help uncluttering! Please enter me in the drawing – thanks! I would like to enter the drawing, thank you. I need this labelmaker to label the place for my new labelmaker! Yes! Please add my entry to the contest~! Please sign me up, I could use this! Thanks for doing this giveaway. I would love to enter this contest for the DYMO labelmaker! I love tools for organizing. The label maker is definitely not appropriate for your Unitasker Wednesday feature. It has a million uses! While I hate to label people, I feel this labelmaker will totally help my uncluttering fantasies. P.S. Sorry for the pun. I’d like to be entered into the drawing please. I’ve wanted a label maker for awhile, but never got around to purchasing one. Ooh, I am very interested in this. It would help me so much in my organizational efforts, which are always an uphill battle. i’ve been wanting a labelmaker for a while. i’d like to enter! sign me up! I need this!! Sign me up PLEASE!! I so need this. I’m a labeling junkie without a dealer at the moment and have using all my self control not to buy another labeler. I was just thinking about buying one of these, so sign me up! I’m a natural clutterer and have been trying to get everything organized, which sometimes feels impossible. But I’m working at it slowly and steadily, and blogs like yours are a great help. Thanks! Oooh! I’d love to enter for the labeler giveaway! being able to make labels might get my wife to put my shirts on the right shelf (when she puts away my clean clothes which isn’t often). This is great, thanks. If I win, I can replace all my computer print out labels taped to boxes….tacky. I’d love to enter this contest. Sign me up-I’d get so much use out of it. This label maker sounds great. Please count me in. Neat! I’ve always wanted a label maker, please add my name to the hat. Please sign me up and keep up the great work! Count me in–we just moved into our first home, and I could definitely use a label maker! I would really use this item as I need to organize my “stuff” in my small mobile home space. Please enter me in the contest. I’m in for the drawing! Odds are slightly better than winning the lottery. Wow what a great giveaway! Please count me in and thanks for the opportunity! I am formally indicating that I want to participate in the drawing. Please enter me in the drawing. I could really use a label maker. Thanks. Pick me!! I want that cool gadget!! Definitely sign me up! Dyno’s are the best! I Love to stick on labels. Please enter me in the giveaway. Please enter me into the contest! Thanks!! I really need one of these. Enter me into the contest, please. I love label makers! Please enter me in the contest. Ooo, I want a labelmaker! Pick me, pick me! This label maker looks to be much nicer than the one I currently use. Nicer form-factor also. Mine’s a bit bulky and squarish. Good contest. I would love the label maker!! Thanks for the giveaway! I’d love to win the labeler. I love Dymo products, please enter me in the contest!! I would love to win this label maker, too! I would love to have the label maker for scrapbooking! I love the Unclutterer (a personal required read). Kudos and thanks to Dymo and Unclutterer for the drawing opportunity. I would like to enter the contest. Thanks. I comment for the win! I am interested in entering the labelmaker contest. Thanks! I would like to be entered in the contest! Thanks! I have longed for a labelmaker but never found one in secondhand stores. This would make it easier for myself, my family, neighbors and colleagues to find and use our shared items. A label maker of my very own?? Sign me up! Thanks! Cool! I’d love to have one of these! Thank you! I most definitely want to participate in the drawing! Thx! Pick me, pick me! 🙂 I would LOVE one of those. I need one of these so I can finish the DIY magnetic spice rack project I started (saw it here!). Thank you! I so need a label maker!!!! I hope I win! Hope my number comes up! Thanks for thinking of us and our labelling needs. I would love to be entered in the drawing. Thank you! I would love to win – thanks for the invite! I would like to be entered. Thanks. I’d love to be entered in the drawing, too! Thanks! OOOOOOooohhhh! I’ve wanted a label-maker for a while — please enter me in the drawing! I’d love to be entered in the drawing. Thank you! Dymo is great! Please enter me in the contest. Thanks! I would certainly like to win one. Please enter me into the contest. Thanks!! please enter me too! thanks! Enter me into the label maker contest! Sounds great! I’d love to be a part of the drawing, I love labelmakers! I’d love to enter – I’ve just now started a year-long home organization project – a room a month! I would like to enter, thanks! Just what I need to get my garage & all my tools finally in order…! I’d like to enter the label-maker give away. The Dymo labelmaker would be just the ticket for labeling the cabinets in our new church fellowship hall! This would be great! Please add my entry! Who doesn’t need a new label maker?! Sign me up! I would love to win one of these. Sign me up! Oh, how handy! I’m in! This thing sounds great — thanks for doing this. I would love to win the Dymo labelmaker! I would love the opportunity to win the labeler!! Thanks!! Oooh I’d like to win this!! Thanks for the offer. Please count me in. I’d like to enter too. Thanks! I would love to have the labelmaker! I love to label things and it helps around the house! Thanks! Would love to get my hands on this. Please enter me. I’d love to win a new label maker . . . thanks! i would like to participate in the drawing! The label maker would be great! I had an older one and used it to death. Literally. LOVED IT. Sign me up. I’d like to enter. Cheers! Oh yes, please do enter me into the drawing – I’ve been eyeing one of those…. Yay for giving away free things! after winning, the first thing I will do is label my new label maker: fred. Erin, it would be awesome if I won this great labelmaker. I would certainly put it to good use. i’ve had a chance to use one of these at work & i would LOVE one for personal use!!! I would love to enter to win this labelmaker. I love labelmakers!!!! My roommate thinks I’m crazy because I label everything so this would make it so much better! No more post-it notes and tape! I want to win this labelmaker!!! thanxxxx! Please enter me in the contest. Thanks for the chance to win! Throw my name in the bucket! Love the site! Ooo! I hope I win! Count me in, the labelmaker is the one Serious Organizer purchase I’ve been putting off. Please enter me – thanks for all the great posts. My DYMO just broke, so I would love to have a replacement. Thanks! Please enter me, just moved and would love a DYMO. i’ve been dreaming of having a label-maker! Here’s my entry. Thank you. Oh man A free DYMO would really rock right now! Please enter me in the draw for this fab labeller. And, thanks for a great website! How clever you are! I now want to replace my old labelmaker with a DYMO whether I win or not. But winning one would be awesome. Please pick me! Daughter “borrowed” my Dymo… wife “claimed” the other.. now I want another! I would love to win the labelmaker!!! I want to participate in the drawing. I need to get organized! Thanks. Who doesn’t love a labelmaker? If I won, I think I might just have to go on a crazy labeling spree. Sign me up! I love labels! I’m an organizing freak and I’ve just discovered my love for label-makers (albeit borrowed). I’d love one of my very own…sign me up! I was going to ask for this for Christmas! Since we moved I have been working extra hard to get organized. Count me in! I’m a sucker for organization and labels and what could be better than a lovely DYMO?! Please enter me! I’m in need of a labelmaker. I could use a label maker to make things easier when we move next year. I would like to enter. I would love to enter this contest! I just recently moved in to a new home and am trying so hard to start out on the right organizational foot – a label maker would be perfect! How did you know that I’ve been looking for a label maker like this one!?!? Please enter me in the drawing. Please enter me into the drawing, thank you! Toss my name in for the DYMO! I’d love to see what it’s capable of. Tossing my name into the hopper! I’d like to be entered in the drawing. Thanks! Oh wow, would I LOVE to win this!!! This would be great, my wife and I would use this all over the house. Sign me up! I’d like to put my name into the running, this would be a very useful device! I love your blog and would love to be entered in your drawing. Thanks! I’d be happy to enter. Thanks! I would love to win a labelmaker. Thanks. Ooohhh labelmaker!!! I want one! This is my entry – thank you! Throw me in the hat! I could SO use this! My kids are mess machines. Come on big money!!!! Okay, I may watch too many old game shows. I sure could use that DYMO. Thanks for a great blog. You don’t mention whether the draw is open to everyone or just those in America, but if us foreigners are eligible, please count me in. I love labels. Count me in please! Let it roll! No whammy, no whammy! What a great contest! I’m not necessarily in a rush to replace Brother P-touch, but I’d be willing to give the Dymo a test drive; then I’ll donate one model to a local school or non-profit. I have been looking at label makers for a while and this would be the best way to get one! Count me in. I have been eyeballing one of these for weeks! I have a very small space for sewing and crafting that I’m trying to organize and this would help so much! DYMO Labelmaker entry – what a bonus for just reading I site I enjoy! Pick me, pick me! My dymo machine has died, so would love a new replacemetn. I would love this labelmaker! I would love to have a label maker. Please toss my name in the hat. Are Canadians eligible? If we are, I would like to be entered. Thanks! This will supersede my Sharpie and masking tape! I have one of these on my Wish List. Please put me in the drawing! I would love one of these! Please enter me in the drawing so I can retire my aging P-Touch! I VOTE for ME to win the labelmaker! I’ve been wanting one of these!!! Thank you! I would love it. Need something to label all my drawers of parts! I definitely want to be entered for this contest! I need a labelmaker! I’ve been using index cards and scotch tape for ages. I’m so glad I found you and started receiving your emails. You’re the motivation I’ve needed for a long time. I’d make so much more progress in my disorganized mess if I had a DYMO labelmaker. Please enter me in the give-away. I’ve got my fingers crossed. Thanks. I would love to be entered! Yes, Please! We’ve had four moves in as many years, and during that time we added a baby (oy! the clothes alone! ), so we have lots of things that need lots of labels. Crossing my fingers that the random number generator likes me! Wow, this is sure a popular idea! If I win, can I label the labelmaker too? 1000 to 1 chance, why not! What a neat little item! It reminds me of that Seinfeld episode about the ‘re-gifter’. Too funny. I would love to enter too – if Canadians are allowed. I would absolutely LOVE a labeler!!!! Not only could I label items that I am organizing…but it could help me remember my family members and pets! i literally wore my old one out. please enter me! I need a Dymo in my life. Count me in! Wow – I can think of so many uses for this. Count me in! Please enter me in the drawing! I have been meaning to get one of these for the longest time! I want to be entered in the drawing! Label maker! Heck Yes! I’ve been borrowing my colleagues. Time to get my own. Enter me please! I love the site, and would love a new label maker too. Love the Jumbo Jerky Works. I would like to enter the drawing for the label maker. Count me in, I’d love to have one of those and start labeling my boxes of craft supplies! I want a label maker! So many boxes to identify for future reference! My entry! I could really use this. Nifty! Thanks for doing this! I would like to participate in the drawing. Thanks. Ooooh! I’d love to win this! Mine just broke. I NEED a new one! I’d like to be entered into the drawing. Thanks! Oooooooooo!!!! Pick me! Pick me! I would love to enter the drawing!! Thanks for all the work you do on your blog! It’s always full of great ideas! My husband gave me a label maker years ago as a “new job” present – he knows the joys that an organized space gives me! It has bit the dust, so this would be a joy! A labelmaker changed the way my Station works. Now it could have chance at home. Sign Me Up!!! Sure, sign me up for the drawing! I’d be thrilled to win a new Dymo labelmaker. If I win, I’ll pass my current one on to one of my brothers/sister-in-laws. I’d love to win the Dymo labelmaker! Fancy digital magic labelmaker? Count me in, please! ooo a label maker! the first step in my quest to unclutter! My family is in dire need of a label maker. Greetings – Just what I was intending to purchase! Please let me be the one to take this item off of your clutter list. I promise it will not collect dust. Hey, enjoy the site and I’d love to enter the drawing. Thanks! I want to make labels! Even though I’ve got HORRIBLE luck with drawings. I need all the organizational help I can get! Please enter me for a chance to win the DYMO labelmaker. I would like to participate in the drawing. Thank you! A labeler that could be put on my file cabinet or refrigerator would help! A labeller is definitely something we could use! I would absolutely like one of these. This website is awesome. Thanks for all your tips! Please enter me in this drawing. Thanks so much. Oooh, I would love a labelmaker. I love your website – & I’d really love to win the label maker! Thanks! I’d love a fancy new label maker!!! I want to be an unclutterer and I know this tool will help me! Please enter me in your contest. Thanks. Count me in for wanting a label maker. 😀 Thanks! I’ve never owned a labeler before. I’ve only used one a couple of times so this would really come in handy with organizing me stuff. So please, sign me up for the contest! I live on a boat. Every single throughhull, wire, pipe, and toggle must be labelled. Please, oh please, sign me up. My old labelmaker just had its final splash a few weeks back. I love labelling and my label maker just died 🙁 Please enter me in the contest to win – thanks! I love me some labels! Please enter my name! Count me in! I’d love one. I’d love to win one if us foreigners are in the pool. We spent today re-organising and labelling in work. We decided we wanted one! I’d like to enter and return my stolen one back to my mother! I’d love a new labelmaker! Oh,oh, pick me, pick me! In other words, I would definitely like to participate in the opportunity to acquire a new lablemaker. Thanks so very much – I’d love to enter the drawing! I’d like to enter the drawing. Thanks! I could certainly use a label maker as I get ready for college! Not sure if I’m eligible cause I’m an Australian, but enter me anyway! I’d love a Dymo, my scotch taped computer printed labels are so lame. Oooh, please sign me up! I would like to be added into the pool. It sounds like a wonderful product. oooh, I was just thinking that I’d like to label all of my flour containers. If I won, I would be able to! I’d love to be a part of the give away. This is the first blog I check every day. Love the ideas here! Here is my entry. I love this website! I would like to enter! Sign me up. I have been a fan of label devices since I first read David Allen. Pretty much worn my first Brother p-touch out. Would love to try a Dymo next. Had one of their clicky models back in my childhood. Thanks! Would love to win so please enter me. Please include me in your drawing! Thanks. Definitely interested in this labeler — anything that might make me a bit neater is a good thing. Hi, please enter me in the drawing. Thanks. Please enter me in the giveaway! I would LOVE this! Thanks! Wow, what a great prize. I’ve always wanted one of this gizmos – think of all the organising I could do. P.s. I’m from australia am I eligible? Oooh, those Dymo labelers are da bomb! Please enter me in the giveaway. I could really use one–thanks for hosting the contest! I’d love to win a labeler! Please enter me – I NEED a label maker!! I’d like to enter; my high school’s robotics club’s inventory is very much in need of uncluttering. LOVE those things. Please enter me in the drawing. Thanks! I would love to use a label maker too! I would like to be entered into this contest! I could go for some organizational labeling!! Woohoo! I love using these at work and always wanted one to use at home! Please enter me into the contest! BTW… love your site….. great tips! I’d like to be entered into the contest. Hey, I could use a label maker for my cables. oh please! I would love one! Thanks! I would love a label maker! I would like to win this! I’d use it at work and at home. I love labeling. I really want this labelmaker!! I love love love lable babies! I would really like to get my hands on this on! I label everything and I LOVE IT. My 6 year old even loves to make labels, so this could be hers if I win! Those things come in handy. Here’s my entry! Would love to win one if eligible. Count me in. I’m *totally*confident* that it’s possible to ship an awesome labelmaker to Australia. New toy! Tool, I mean. What a fabulous freebie in time for the disorganized holiday season. Excellent! Another happy Canadian here. I’m always slowing down a put-away because I want to label the cartons. It would be so handy to win it. There are not many things I want, actually, but this seems so practical! I’m in for the drawing! Mmmm, labels! Sign me up, please, and thanks for a fun contest! I would love to enter, I would love to get organized! Count me in, I label everything! I really need a new labelmaker! Thanks. I would love one of these. Please enter me into the drawing. This I could use. I’m in! I’ve so always wanted one of these, but never quite manage to actually get one. Please enter me, and then I can stop Sharpie-ing on cut up Avery labels. Please enter my name in the drawing for the label maker. I am from Australia also but would love to enter. I am one of the hundreds who’d love to win this, too. Thanks for the great giveaway! I would love to win this and certainly could put it to good use! Pick me Random number generating website! I have lots of things I could label! I would like to be added to the drawing. I would LOVE one of these – please sign me up! I would love to win this labelmaker. Please enter me in drawing. I am in process of reorganizing our office & I feel that a label maker would be helpful..I would loce it! please enter me as I am reorganizing our office & would find the labelmaker helpful. I so so so so so much want one! Please enter me in the drawing! I want to participate in the contest. Thanks! Oooh, love it. Please enter me, thanks. Oooh… lots of print styles! Please enter me in your drawing. Pick me! Pick me! Thank you! I want please :)! I don’t know whether I’m eligible though as I’m not from the US :(. I have been wanting a Dymo for a quite a while and this seems absolutely perfect – so please enter me in the draw. sign me up, I need to label my kids. Love label makers! I’d like to enter please. Thank you! Yes, please enter me in the drawing! Me, me, me! I would love to have a DYMO. Ooo yes please, is New Zealand too far away to ship? Ooohh… I would love this! Would love this – have a long list of items to label! Yes! Please enter me in the raffle! I want to have it! pleeeze! Sign me up for one of these wonders of human making…Gotta play to win i guess. Sign me on… I would LOVE one. I’d like to enter the drawing for the DYMO labelmaker. I’m also in Germany and would like to enter! Please sign me up. Expecting lil one in February and need to organize this whole apt full of clutter before then!! I’d like a dynamo label maker. We have one, but it’s older and doesn’t have a display. Wish me luck! Another UK bid please. Actually I’m in Tanzania, but imagine how helpful it would be when I get a new house back in England and a new teaching job! I would love a Dymo. Please enter me. Please enter me into the drawing for the Dymo label maker. Thank you for all your wonderful tips. Ohhhh! Please enter me in the drawing. I’d love to have this, for my pantry containers, my runner gear, my binders… ahhhh. Please count me in as well! 🙂 Thank you! I’d love to participate in this – I always thought this would be a great tool! Oh yeah i need one of these dymos! I am ready to label – please enter me. I totally need a Dynamo! I really need this for work and home!! I would love this prize! Please enter me! Thanks for the awesome giveaway. I would love to be entered for this nifty tool! Great contest item! Please include me for the draw. I wonder if I could label everything in my home…? OOh, I would love to win this labelmaker. I am working on trying to get everything in my house organized and this would make it so much cleaner looking. I would love one. Remember that episode of The Simspons where Bart gets the label maker? I have wanted it since then. Oh, I love the Dymo that I use at work. I would really like having one at home too. Lots of folders to label. Could definitely use such an excellent labeler. Me too! So. Much. Needs. Labels. I would love a label maker, especially since I am having a baby soon. Teaching him/her about organizing would be great! Please sign me up!! I would probably go so crazy I’d end up labeling my KIDS! Hi I would love to enter the contest for the label maker. Those things are a great thing to have in either the home or at work. plaese could you include me. Whoo! A DYMO. I can think of lots of things to use this for–I have a four year old with lots and lots of leetle bitty stuff that needs to be corralled. Thanks very much for the opportunity to win!! Ooh, I’d love one. Sign me up! I’d love one for my home since it works so well in the office. I’d love to enter! Sign me up. I would love to be entered in the *drawing* for the Dymo labeler and i love your site! I have such love for labelmakers. /geek Sign me up! Label me as a drawing contestant! I would love to be entered in the drawing for the label maker, thank you! oooh, I’d love one of these! Count me in please! I’d love one! I am always borrowing the one from work, so it would be nice to have one of my own! Thanks! I’d LOOOVVVE tto win the label maker. My job has started an initiative to have out work areas decluttered, organized and labeled. I can’t find the label makers my site has and when I do they are out of labels so this will be real handy. I’d also use it around my house too. Slightly OCD and would love something like this! I am an un organized mess… and need all the help I can get. A labeler is a freat way to start. I LOVE ME SOME DYMOS! Count me in! I love the one we’ve got at work, and would love to have one at home. Please enter me. The labelmaker I have right now is pretty beat up from loaning it out so much. Time for a new one. I would love to win a labelmaker — I haven’t had one for a very long time, and I’ve never had a really good one (remember those old labelers that would stamp the letters through the colored tape?). I can use this for my home office. Thanks! This is the kind of thing that makes me excited. Do I need help? Yes I do. Help, in the form of this label maker! A label maker would make me an even cleverer mom! oooh a label maker! how handy that would be! labels for my tools, his tools, spice jars, folders, cables, phones. Count me in please. I’d like to enter, please. Oh, oh, enter me! I could really use a good label maker. I’d like to be entered! Love your site, of course. Please enter me! I love labelling and have been making do with making my own. I would love this lable maker, my son has claimed the old one. Now I need my own. yes, throw my name in the hat please. This will help with organising files! Please submit my name into the contest. Please enter me in the contest for one of these labeling beauties! I’d like one, please enter me in the contest. Please enter me in the contest, great site, keep up the good work! I would like the label maker please. Sign me up. Looks perfect. Please enter me in the drawing. Thanks! I appreciate the chance to win a labelmaker. I’d like to enter too…I could really use a label maker. Ohmigosh I’ve been wanting one of these forever! Me me me! I promise I will take very good care of it and be organized from now on. I want to be entered in the draw! I love labelmakers! Yay! I love these things. I use the one at work all the time for phones, computers and other devices. I’d really like one I can use at home! Enter me please! That looks awesome! I’m so disorganized and could use all the help I can get. This would get me started in the right direction (I hope!). Sign me up for the giveaway… i need one of these at home. Please enter me in the contest. I converted to GTD ever since I read David Allen’s book. I notice that everything in my house that is messy and cluttered is unlabeled or labeled with a scribble. Everything that is neat and clean is labeled clearly. That tells me something. Please! I’m labeling with masking tape and sharpies! Please choose me! I love labelers! i want to participate in the drawing pls. thanks for the tips. I just got new tape for my P-Touch. I could use aone like this that prints on other media. hi, I’d like to enter the drawing. I would love to win this! Please enter me in the random drawing. Thanks so much!! Labels don’t mean anything, anymore. Only right-wingers persist in using them. As a right-wing liberal, I’d love to have one of these. Please, oh please… Pick me!!!! I would love this label maker to use at school. I also love random.org. Thanks for having this fun contest! Ohhh I love label makers!!! I am going to label everything!!! So many boxes, so few labels. I’d love a label maker. Please include me in the drawing. Thanks for having a gift-a-way. Ooh!! Gimme gimme!!! Me want DYMO labelmaker!!! Pretty Please, sign me up! With a perfectly organized and symmetrical pile of sugar on top! I’ll label everything, even the doorknobs. I would like a labelmaker. I had one in the past but it died. I had wake for it and have been in morning. But I think it is about time to get a new one. So please enter me in your contest. I would love a Dymo! Please enter me, too! Ever since reading an article on how these are helpful in my local paper, I have hankered after a label maker… do enter my name in the drawing. Thank you. Enter me in the raffle for the label maker please! My office and this label maker could be friends. Sign me up, please! Pick me, pick me, pick me! We really really really need one. OOhh OOoh me, me!! I love label makers and my dear husband broke mine. I’m in Australia and if it’s not too late I’d like to enter. I would love to have one for work as well as home! Can I enter twice? I’d love a label maker! Throw my name in the “hat,” please! I just discovered your unclutterer and am loving it! Count me in……I’m already looking around the office to see what I can use it on. I’d love a lable maker, I’m just too cheap to go out and buy one. I would love to save some tymo with this Dymo! Please enter me in the contest – I want one!! Thanks! Please enter me into the contest. I currently use Avery labels that I write on to label everythign. This would be wonderful!!! I have wanted a label maker for years! Please enter me! Thanks! Thanks for doing this – count me in! Entering. I’ve always wanted one. …and this is my entry! Thanks, Carlo. I’d like to enter this contest. No doubt, the first thing I would label would be my new DYMO LetraTag Plus Personal Labelmaker. Love Bobby’s comment above! Too funny. I would love to enter the contest, but would love even more to WIN the contest! Yes, please count me in the drawing. Thank you! I hope I am not too late…better late than never. Antway I have been wanting one of these and it is just something I never think about looking at in the store while I am there. So thinks for the reminder and the chance to win one. Please, Sign me up for the drawing! i’d love to win this, but soooo many comments! Great contest! I’d like to enter the drawing. Thanks! Hi. I would love a chance to win this labelmaker. Please enter me in the drawing. Thanks! Oh my gosh – I just told my husband I want to buy one of these! Please pick me! I’d love to be entered to win! Oh my gosh…how perfect. Could you please enter my name into the mix? Thank you for giving away one of these!